Rate: $110 USD per person. Includes: Rounda trip transportation, bilingual naturalist guide, entrance fees, bottled water, lunch. This tour offers an unforgettable hiking experience through trails marked with the remains of previous lava flows of the impressive and majestic Arenal Volcano. 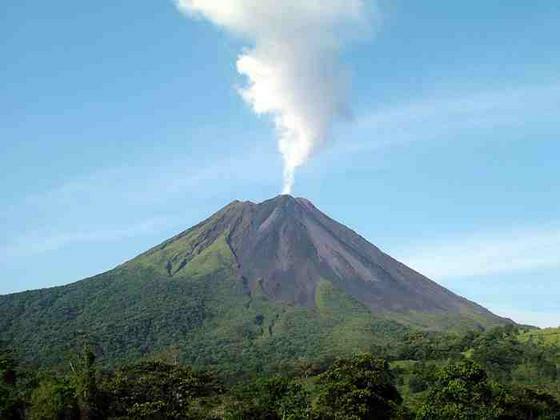 The main attraction of La Fortuna is the Arenal Volcano with its nearly perfect cone shape, and a height of 1633 meters. Along the hike you will discover the abundant flora and some fauna which inhabits the a rainforest under re-generation; your guide will tell you all about the Arenal Volcano history and activity. After our hike on this popular volcano we will continue our journey to La Fortuna Waterfall a beautiful place with a lot of vegetation around it, once there we will hike down (500 steps with some resting areas) to the waterfall base to go for a swim on the cool pristine waters of La Fortuna river, after all this exercise you will be hungry so we will take to a nice restaurant near by to enjoy a delicious lunch. Insect repellent, comfortable clothing, trekking shoes (sandals or tevas are not allowed), swimsuit, binoculars, camera, sunscreen, towel.